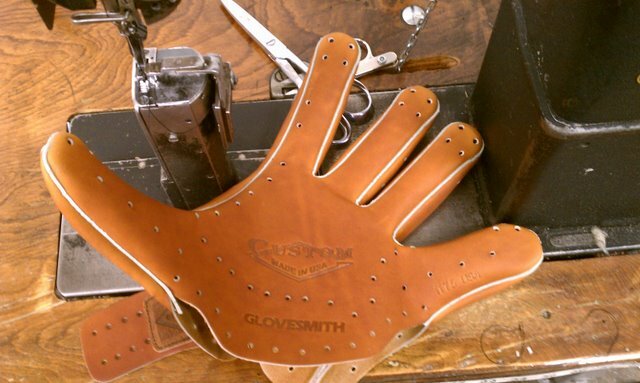 WWW.GLOVE-WORKS.COM BASEBALL GLOVE COLLECTOR FORUM • View topic - Glovesmith Too Heavy for Outfield? Glovesmith Too Heavy for Outfield? Post subject: Glovesmith Too Heavy for Outfield? I'm in the market for a new outfield glove and know that Glovesmith makes an awesome custom glove, my friend has a few but he's an infielder. He said that the gloves are great but he worries that an outfielder sized one will be too heavy. For those who have outfield sized Glovesmiths(1275) are they too heavy r do they work fine? Post subject: Re: Glovesmith Too Heavy for Outfield? Talking about a USA custom? Depends on two things. 1) skip the palm pad (you have to delete it) and 2) choose the stiff DuraTan wheat or the softer Blonde leather. The others are heavier. I am going to guess that a wheat 1275USA without the pad would be about 25 oz.